Indie/emo pioneers American Football to reissue their highly influential self-titled full length and reunite for their first performances in over 15 years. This fall the influential late '90s indie rock trio American Football - Mike Kinsella (Cap'n Jazz, Owen, Owls), Steve Lamos, and Steve Holmes - will reunite for their first live shows since disbanding 15 years ago. The band will play September 28th at The Pygmalion Festival in Champaign/Urbana, IL, the site of the band's formation and home of Polyvinyl Records, the storied indie label who released their original EP and self-titled full-length album. On October 11th American Football visit New York City for a show at Webster Hall. Tickets for both shows go on sale Friday, April 25th via americanfootballmusic.com. The reunion shows are preceded by the May 20th reissue of American Football's seminal self-titled 1999 release. Available on 2xLP, 2xCD, cassette tape, and digital formats, the American Football (Deluxe Edition) reissue features an album's worth of rare live recordings, demos, and practice sessions (in which the group rehearsed material they never recorded elsewhere) to complement the original record. Beautifully expanded packaging incorporates new photographs from Chris Strong along with lyrics, detailed liner notes written by the band, and never-before-seen band pictures. 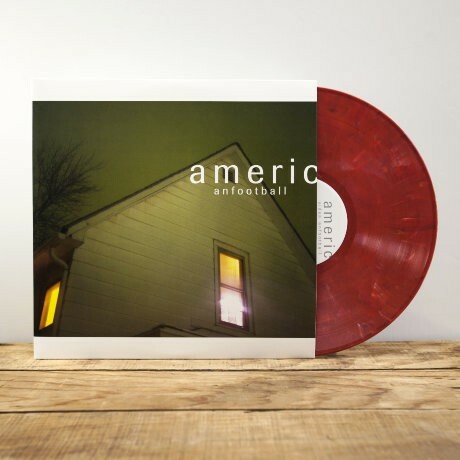 In the 15 years since its release, American Football's self-titled debut full-length has quietly become one of the most fiercely beloved titles in the Polyvinyl catalog. Though the trio only played a few shows and released just one other record (a three-song EP that preceded this full-length), their influence and legacy has steadily continued to grow in the time after they disbanded. The incredible reverence for American Football and their self-titled album was on display earlier this year when upon launch of the pre-order, fans eagerly anticipating new output from the band crashed the Polyvinyl website for the first time in the label's history. From its now iconic artwork to the band's unique songwriting approach (highlighted by an emphasis on shifting time signatures and sincere lyrics), American Football proves a record doesn't become a true classic through flashiness or catering to trends, but rather the deep emotional connection it forges between the music and the listener. Countdown til a Chicago date is announced. American foot ball teams three player is here and we know that this thing is good or may not be good for our homeworkforme work. Hope we can easily find helping material for us because we know that this is good for this team and they must be able to remove problems.